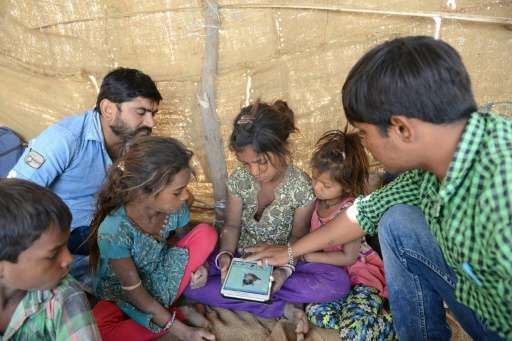 Sheltered beneath a canvas sheet to escape the blistering desert sun, miles from any roads or power lines, a group of Indian children huddle around a tablet and experience the internet for the very first time. 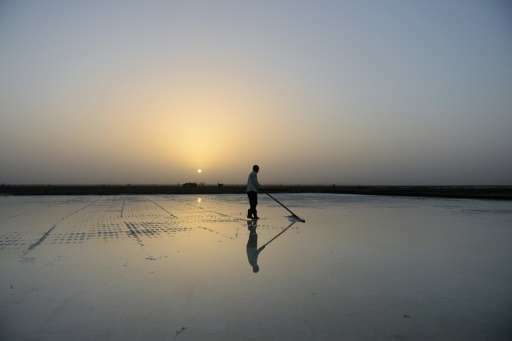 The remote wi-fi connection is powered by a van bringing the digital world to around 10,000 families living on the inhospitable salt flats of western Gujarat state, where they work eight months a year in extreme conditions. The salt desert known as the Little Rann of Kutch, is roughly 180 kilometres (110 miles) from state capital Ahmedabad. The workers mining the land for salt live without electricity and other amenities while their children attend school in mud huts or tin sheds where they lack even the most basic learning supplies. Bringing the web to this isolated region is no small feat, with communities scattered over thousands of square kilometres. The crew from NGO Agariya Heethrakshak Manch, one of the stakeholders in the project, first erected a powerful digital tower on the outskirts of the desert capable of sending a signal up to 60 kilometres away. Then they fixed an antenna to the top of their van and hit the road armed with laptops, tablets and printers. They visit each of the region's 14 makeshift schools approximately once per week, teaching the students how to use technology to access the internet and learn digital skills. The students are eager to learn, crowding around to watch online videos about maths and science. "The internet and these tablets have made learning much more fun and engaging for all the children. They now have so much to learn and explore," Pankti Jog of Agariya Heethrakshak Manch told AFP. The youngsters are not the only ones discovering the joys of the web. This mobile service has also helped their parents—migrants who make the annual journey to the salt plains for work—access government welfare schemes online, Jog said. The crew hopes to increase the frequency of school visits to once every three days once they get more vans. Currently their single van speeds between three schools a day, spending about two hours at each, Jog said. "We have connected around 800 students to internet and digital learning in this remote region", she said.